Subtraction is a simple arithmetic operation used on an everyday basis. So this should be a very short lesson. Instead, I would like to write a bit more than usual and present you a few different ways when and how the subtraction can be used in Excel. Take a look at the following example. It is a very simple one, but many people do make errors when they try to calculate the result. The result of the following operation is -3, and not 6. The error may occur because people forget (or don’t know) about operator precedence. Multiplication and division take precedence over addition and subtraction. So, if we want the result to be 6, we need to insert parentheses in the right places. This result of the above notation will be 6. That because the subtraction, not multiplication, is now the first operation. Look at the image below. It shows two groups of number, with a green and blue background. What we will do here, is to subtract the green numbers from the blue ones using one operation, called paste special. Let’s select cells from A1 to B2 and copy them. 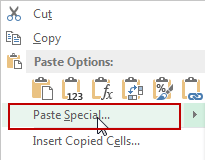 Now, right-click cell D1 and select Paste Special. 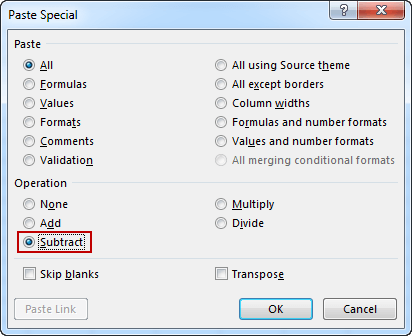 Select Subtract and click the OK button. Each of these formulas is also automatically converted to values.